Americium (95Am) is an artificial element, and thus a standard atomic weight cannot be given. Like all artificial elements, it has no known stable isotopes. The first isotope to be synthesized was 241Am in 1944. The artificial element decays by ejecting alpha particles. Americium has an atomic number of 95 (the number of protons in the nucleus of the americium atom). Eighteen radioisotopes of americium from 229Am to 247Am (with the exception of 231Am) have been characterized, with the most stable being 243Am with a half-life of 7,370 years, and 241Am with a half-life of 432.2 years. All of the remaining radioactive isotopes have half-lives that are less than 51 hours, and the majority of these have half-lives that are less than 100 minutes. This element also has 8 meta states, with the most stable being 242mAm (t1/2 = 141 years). Americium-241 is used in ionization smoke detectors. Americium-241 is the most prevalent isotope of americium in nuclear waste. It is the isotope used in an americium smoke detector based on an ionization chamber. It is a potential fuel for long-lifetime radioisotope thermoelectric generators. Possible parent nuclides: beta from 241Pu, electron capture from 241Cm, alpha from 245Bk. Americium-241 decays by alpha emission, with a by-product of gamma rays. Its presence in plutonium is determined by the original concentration of plutonium-241 and the sample age. Because of the low penetration of alpha radiation, Americium-241 only poses a health risk when ingested or inhaled. Older samples of plutonium containing plutonium-241 contain a buildup of 241Am. A chemical removal of americium from reworked plutonium (e.g. during reworking of plutonium pits) may be required. Americium-242m has a mass of 242.0595492 g/mol. It is one of the rare cases, like 180mTa, where a higher-energy nuclear isomer is more stable than the lower-energy one, Americium-242. 242mAm is fissile (because it has an odd number of neutrons) and has a low critical mass, comparable to that of 239Pu. It has a very high cross section for fission, and if in a nuclear reactor is destroyed relatively quickly. Another report claims that 242mAm has a much lower critical mass, can sustain a chain reaction even as a thin film, and could be used for a novel type of nuclear rocket. Americium-243 has a mass of 243.06138 g/mol and a half-life of 7,370 years, the longest lasting of all americium isotopes. It is formed in the nuclear fuel cycle by neutron capture on plutonium-242 followed by beta decay. 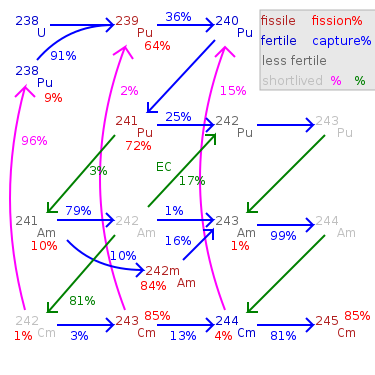 Production increases exponentially with increasing burnup as a total of 5 neutron captures on 238U are required. It decays by either emitting an alpha particle (with a decay energy of 5.27 MeV) to become 239Np, which then quickly decays to 239Pu, or infrequently, by spontaneous fission. 243Am is carcinogenic. 239Np, the daughter of 243Am, emits dangerous gamma rays, making 243Am the most dangerous isotope of americium. Values marked # are not purely derived from experimental data, but at least partly from systematic trends. Spins with weak assignment arguments are enclosed in parentheses – ( ). ^ a b "Americium" Archived 2012-07-29 at WebCite. Argonne National Laboratory, EVS. Retrieved 25 December 2009. ^ "Extremely Efficient Nuclear Fuel Could Take Man To Mars In Just Two Weeks" (Press release). Ben-Gurion University Of The Negev. December 28, 2000. ^ Ronen, Yigal; Shwageraus, E. (2000). "Ultra-thin 241mAm fuel elements in nuclear reactors". Nuclear Instruments and Methods in Physics Research A. 455 (2): 442–451. Bibcode:2000NIMPA.455..442R. doi:10.1016/s0168-9002(00)00506-4. ^ a b "Americium-243" Archived 2011-02-25 at the Wayback Machine. Oak Ridge National Laboratory. Retrieved 25 December 2009. ^ "Isotopes of the Element Americium". Jefferson Lab Science Education. Retrieved 25 December 2009.